The Sabal Trail Natural Gas Pipeline, currently under construction, covers three US States. Opposition stems from civilians and environmental groups, such as the Sierra Club, due to severe environmental impact. However, construction pushes ahead. 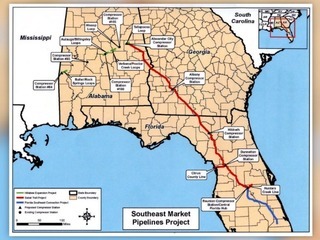 In 2011 the Florida Power and Light Company commissioned NextEra Energy, Spectra Energy and Duke Energy to construct a 515-mile natural gas pipeline originating in Alabama and traversing Georgia before terminating in Florida (Edelstein, 2016). The pipeline is intended to service the gas needs of the central Floridian population. Construction began in 2016, and although originally estimated to be completed in 2017, is now set to be finished in 2021. They have received approval from the U.S. Army Corps of Engineers, as well as the Environmental Protection Agencies from the affected states to continue construction amid protests, as the states value the potential benefits of construction in terms of economic growth and job creation. There are numerous environmental issues associated with this project. To begin with, the pipeline is constructed on notoriously unstable ground, a result of the karst bedrock present in Georgia and Florida, which makes the area prone to sinkholes. The ground’s instability could lead to the emergence of a sinkhole near the pipeline and the related damage to the pipeline could then contaminate groundwater and the Florida aquifer, which provides drinking water for almost 10 million people (Adgie, 2015). The destruction of native animals’ (crocodiles, turtles) habitats, contamination of the air, and infection of groundwater used in agriculture are also possible. Residents who live along the pipeline have growing concerns, and many live in minority communities (Lipscomp, 2017). A compressor which would aid in stabilization of the pipeline was proposed to be built in an African-American community in Georgia which would be a source of constant noise and vibration; thus, being a detriment to an already disadvantaged area, rather than an asset (Bluestein, 2015), in a case of what is known as "environmental racism" in the US environmental justice movement. In 2014, community members and members of the Wiregrass Activists for Clean Energy marched to the Sabal Trail office, raising concerns of eminent domain, as Sabal Trail wished to route the pipeline through private family farms (Adgie, 2014). In Florida local civilians gathered at the Sacred Waters and Crystal Waters camps in efforts to stop or at least delay construction. A coalition of opposition, formed by the Sierra Club, the Gulf Restoration Network and the Flint Riverkeeper had unsuccessfully lodged a lawsuit against the issuance of the Federal construction permits granted for the project (Edelstein, 2016). In Florida the WAALS Watershed Coalition, Inc., who carry out conservation efforts in northern Florida, also tried to take legal action, although their case was dismissed (Patterson, 2016). Comparisons have been made between the Sabal Trail Pipeline and the Dakota Access Pipeline. The Sabal Trail Pipeline does not traverse directly through Native American lands; however, the Seminole Tribe of North Florida opened protest camps along the pipeline’s route and other indigenous tribes believe that the pipeline will have negative impacts on culturally sensitive lands (Luscombe, 2017). Although construction continues on the pipeline, civilians have been successful in causing delays in its finalization. Project Details The pipeline transports 830,000 Dth/day. (A dekatherm (dth) is a unit of energy used primarily to measure natural gas. It is equal to 10 therms or 1,000,000 British thermal units or 1.055 GJ. It is also approximately equal to one thousand cubic feet (Mcf) of natural gas). (Wikipedia). The pipeline is 515 miles long. Why? Explain briefly. No, because the project is still ongoing. Adgie, Joe. (22 Oct. 2014). “Residents Protest Sabal Trail.” Valdosta Daily Times. Valdosta, GA. http://www.valdostadailytimes.com/news/local_news/residents-protests-sabal-trail/article_13bb8c22-59a2-11e4-8568-4bc4f8e58d1d.html. (Accessed on 22.03.2018). Adgie, Joe. (27 Oct. 2015). “EPA Demands Sabal Redirect From Florida Aquifer.” Valdosta Daily Times. Valdosta, GA. http://www.valdostadailytimes.com/news/local_news/epa-demands-sabal-redirect-from-floridan-aquifer/article_3b1df28e-6794-5b75-a7d8-6c388d1d57c7.html. (Accessed on 22.03.2018). Bluestein, Greg. (27 Oct. 2015). “Feds Deliver Blow to Proposed Sabal Trail Pipeline Running through Georgia.” Politically Georgia. 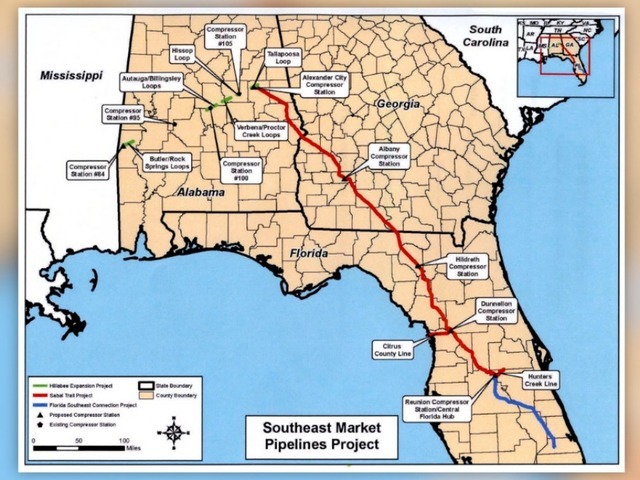 https://politics.myajc.com/blog/politics/feds-deliver-blow-proposed-sabal-trail-pipeline-running-through-georgia/sodORfuXdvPcbd6xqJT7qO/. (Accessed on 22.03.2018). Edelstein, Karen. (29 Nov. 2016) “The Sabal Trail Pipeline: A Sinking Feeling.” Fracttracker Alliance. https://www.fractracker.org/2016/11/sabal-trail-pipeline/. (Accessed on 22.03.2018). Lipscomb, Jessica. (7 Mar. 2017). “Sabal Trail Pipeline will be an Envionrmental and Economic Disaster, Critics Warn” Miami New Times. Miami, FL. http://www.miaminewtimes.com/news/sabal-trail-pipeline-will-be-an-environmental-and-economic-disaster-critics-warn-9188468. (Accessed on 22.03.2018). Luscombe, Richard. (24 Jan. 2017). “Why a Protest Camp in Florida is Being Called the next Standing Rock.” The Guardian. https://www.theguardian.com/environment/2017/jan/24/sabal-trail-pipeline-florida-next-standing-rock-controversy-suwannee-river. (Accessed on 22.03.2018). Patterson, Steve. (14 Nov. 2016). “Gas Pipeline Project Headed to Suwannee River Leads into Georgia Waterway; Sparks Environmental Worries.” The Florida Times Union. Jacksonville, FL. http://www.jacksonville.com/news/2016-11-14/gas-pipeline-project-headed-suwannee-river-leaks-georgia-waterway-sparks. (Accessed on 22.03.2018). Contributor Emilio Mattiuzzo ([email protected]) and Megan Asher ([email protected]) under the supervision of Gabriel Weber ([email protected]).